How do you know if a miner is a Goofus? ...Don't worry, they'll tell you. 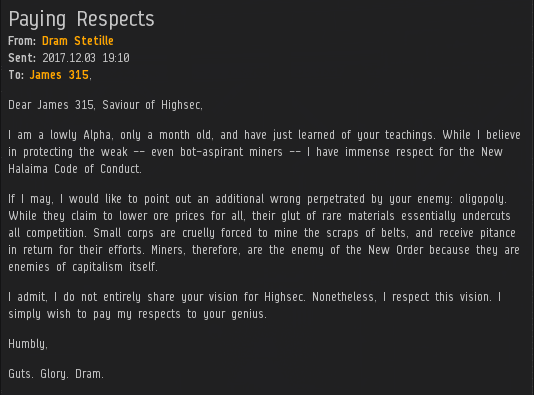 Welcome to yet another glorious edition of the Highsec Miner Grab Bag! You know the tide is turning in our direction when the whole essence of the English-speaking world supports the Code. That's a lot of hearts and minds. 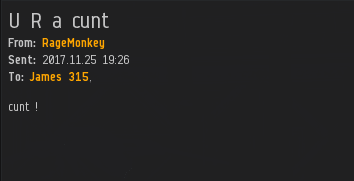 Beware the highsec miner with a calculator. I don't know if ikkeisgek13 forgot to carry a one or whatever, but he's way, way off. 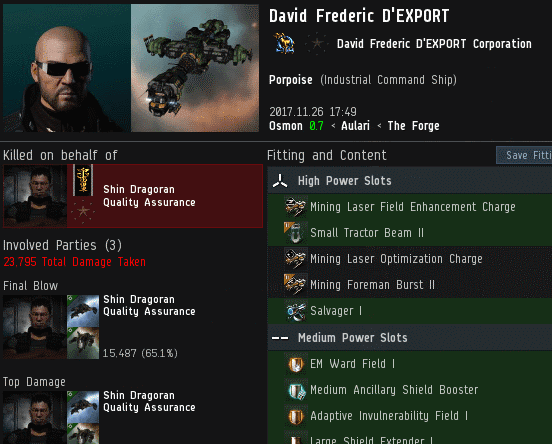 According to my calculations, he owes our Agent 10 million isk. 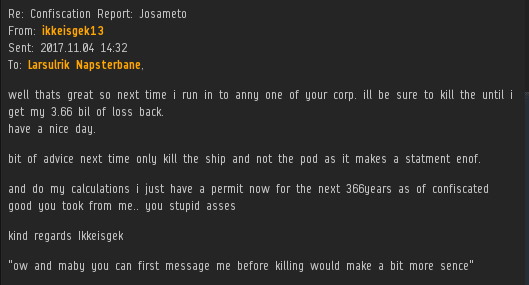 You'll never find an angrier EVE player than one who's recently been engaged in highsec PvE. "New player experience" indeed. 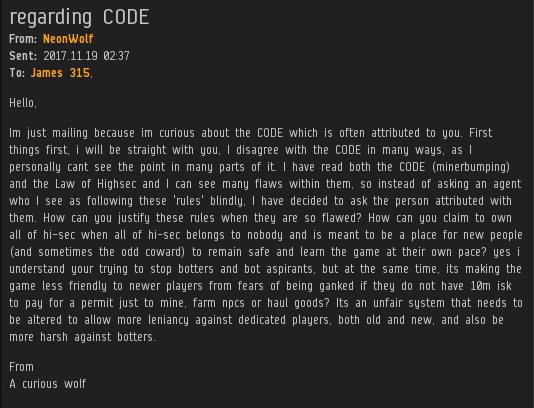 Protip for NeonWolf and his ilk: If you think the Code is "flawed", then you haven't studied the Code closely enough. Nullsec may be stagnant, but highsec has new coalitions forming all the time! Better ask NeonWolf. Apparently he's some sort of expert on the Code. Last month, we read about Original Lucky Maroon's daring double Orca awox in The Secret Message. Our hero offered 10 tech II Catalysts to anyone who could unscramble his name. As far as I know, no one has come forth to claim the prize. 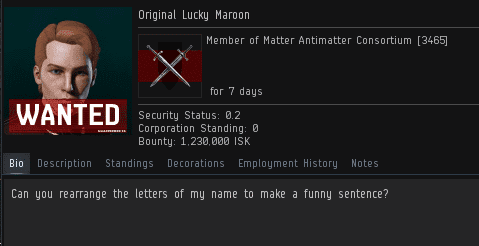 So I'll reveal the answer here: Original Lucky Maroon becomes "I'm gonna kill your Orca". Unfortunately for Original's corpmates, they couldn't solve the puzzle, either. See the difference? Totally unsatisfactory. In fact, RageMonkey was in a particularly bad mood when he sent that message. Earlier in the day, Agent Aaaarrgg wound him up by using the classic New Order trolling tactic of being in local. 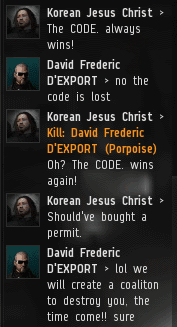 Nothing infuriates a bot-aspirant quite like seeing a member of the mighty CODE. alliance in the system. No wonder they get so angry. We drive them to it--or so I'm told. Like I said before, our Agents don't need to worry about identifying the Goofuses. They reveal themselves. I like the way these goofus-types feel they're entitled to tell us exactly how to do our job. Not wishing to face up to the fact that he was ganked and podded, this particular specimen finds fault with as many aspects of the encounter as he can, no doubt taking comfort in the fact that he at least gave as good as he got. Which, of course, he did not. "If you think the Code is "flawed", then you haven't studied the Code closely enough." I love this line. It's so heartwarming. It reminds us why we do all the good we do. When fishing in the river of life for tuna, it is unavoidable to catch porpoise. I thought they were the smarter mammal of the ocean? Nerfed blog means butthurt code agents. You have been defeated in elite blogging, now go home to momma you shitters. If anything has been nerfed, it's the comments section not the blog. I, for one, am pleased that I can now read your contribution in all its glorious inanity. Enough of your impotent tears will get through that we can continue to laugh at your sperging. You sound very upset, you murder lovers need to calm down and accept that you have been defeated. Please refrain from your normal rage talks and simply put GF and perhaps we will give your lowly status an upgrade. Little johnnie shitter got nerfed! Get bent little johnnie pirtle, now it's harder for you to post your sick pedo fantasies. I sincerely hope you don't go all kalynn on you RL family. Nerfed johnniePedo means a better comments section for all. What is johhny going to do with those extra hours of the day he would normally spend posting and refreshing the page?